The European Southern Observatory (ESO) has contracted architects Auer+Weber to design an extension to its Headquarters at Garching bei München, Germany. The innovatively styled new office building will help to house the growing number of Garching staff, and be the cradle of the technological innovations needed for ESO’s ambitious projects such as the European Extremely Large Telescope. 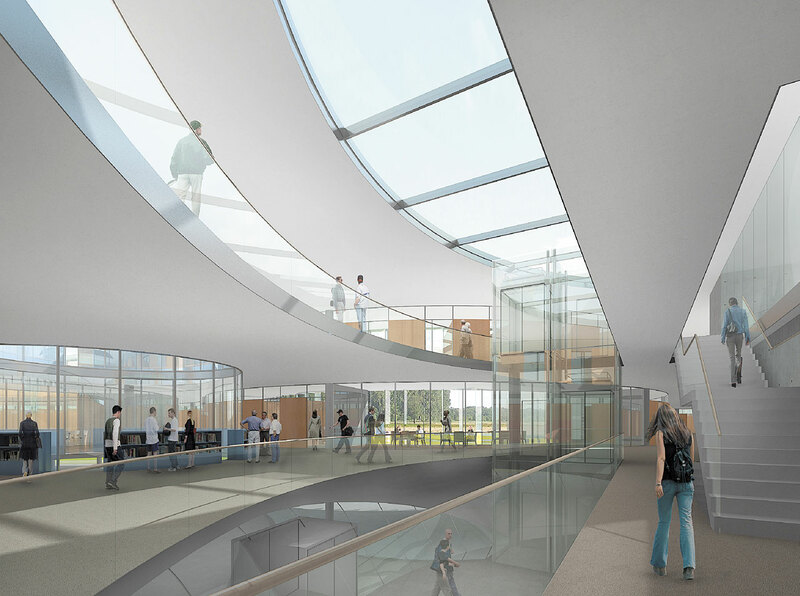 With construction expected to be completed by the end of 2013, the expanded ESO Headquarters will contribute greatly to the development of the Garching research campus. Over a period spanning almost fifty years, ESO’s world-class facilities and scientific work have brought Europe to the forefront of astronomy worldwide. Its vision, combined with meticulous planning and cutting-edge technology, resulted in the Very Large Telescope (VLT), the world’s most advanced visible-light observatory. ESO is now looking to the next generation of telescopes and is building, with its international partners, the Atacama Large Millimeter/submillimeter Array (ALMA), the largest and most advanced telescope of its kind, while its next ambitious project is to build the European Extremely Large Telescope (E-ELT), which will become the world’s biggest eye on the sky with its 39.3-metre mirror. In the process, ESO membership has expanded to 15 Member States, becoming the world’s most productive ground-based observatory. As a direct consequence, there are now 740 people working at its Headquarters in Garching bei München, Germany, and on the three sites in Chile. The current ESO Headquarters was built in 1980 to replace the offices located at CERN, where ESO had only 40 staff members. In the late 1980s a fifth floor was added to accommodate the growing staff complement, but eventually, after two decades, that space has also proved insufficient. ESO has had to rent office space from the nearby Max-Planck Institute to house the nearly 500 staff now working in Garching, and set up temporary offices located directly next to the main building to facilitate exchange between departments. With its staff located in temporary offices and project teams working in different areas of the campus, an expansion of the main ESO building became necessary and the ESO Council decided to look into ways to expand the office capacity at Headquarters. 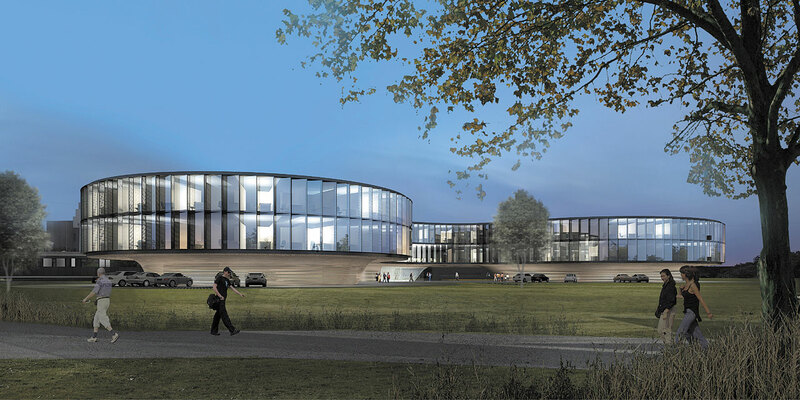 Several plans were proposed as part of an architectural competition, and eventually the Council settled on a design for the Headquarters extension by Auer+Weber. This firm also designed the award-winning Residencia at the Paranal Observatory in Chile, which was featured in the James Bond movie Quantum of Solace. As the general planner, Auer+Weber established the architectural design and complete construction planning for the general contractor Bam Deutschland AG that will build the extension. “The construction of the new building is an important milestone in ESO’s history as it will enable us to work even more efficiently towards achieving our vision of building and operating world-class ground-based observing facilities. At the same time, having all our headquarters staff working in one place will provide a strong sense of identity,” said the Director General of ESO, Tim de Zeeuw. 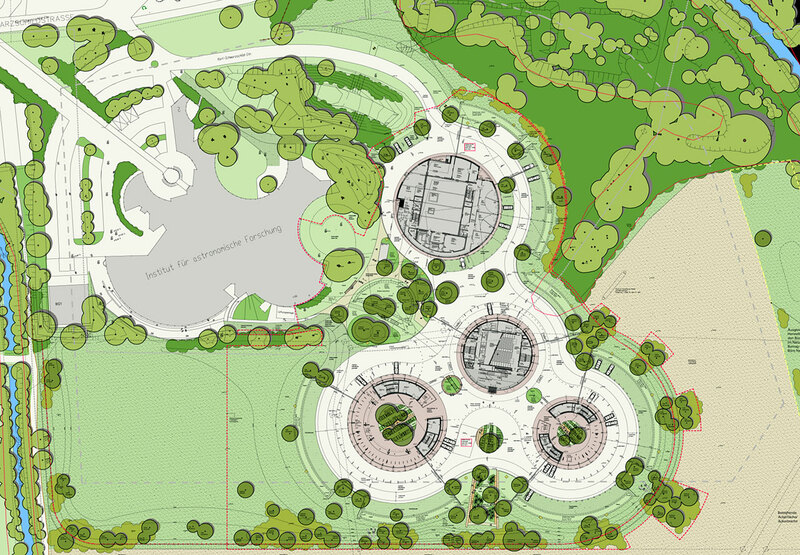 The design for the Headquarters extension is in keeping with the current building by respecting the same curved shapes. It will feature an office building, a technical building and a covered bridge that will connect the new buildings to the original Headquarters. The design makes extensive use of natural light sources and has two inner courtyards. Both new buildings have been labelled “green buildings”. The new office and technical building will have a gross area of 18 700 square metres, which more than doubles ESO’s Headquarters area. The technical building will be a cylinder with a diameter almost matching the size of the 39.3-metre mirror of the E-ELT. It was designed to become a focal point of scientific and technological breakthroughs and has the potential to promote Bavaria’s role in fostering high technology industry. It will be the place where ESO’s most advanced instruments will be developed, built, assembled, tested and upgraded. The technical building will have a gross area of 2900 square metres and will also host one of the largest computer archives of astronomical data in the world. Construction started in January 2012 and is expected to be complete towards the end of 2013.